П.O. reads at Conduit Arts. Photo by Mandy Kitchener. The communication and corruption of biography and autobiography was an accidental theme of Simon Charles’ curated music night at Conduit Arts. When Charles contacted П.O. to read at Melbourne’s newest hybrid arts venue, he didn’t need to give directions. П.O. grew up just across the road, in the few blocks of Fitzroy that eventually made way for the Atherton Gardens housing estate. 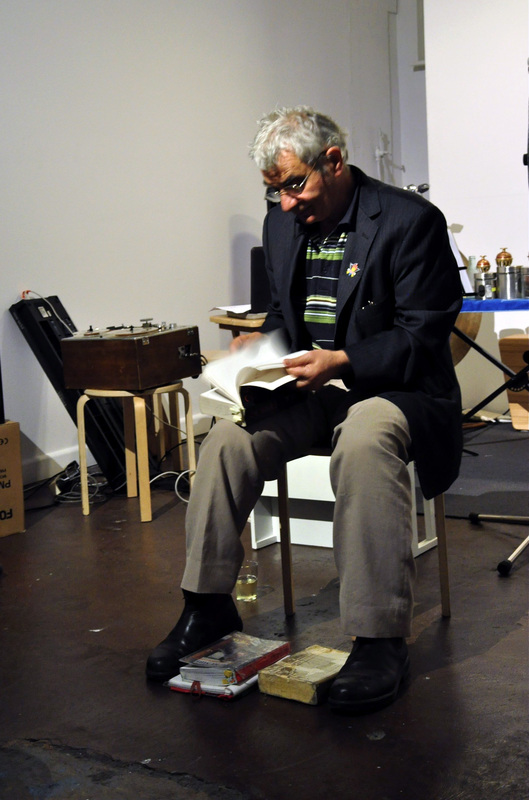 The audience at Conduit on Thursday night were lucky to hear some of П.O.’s seldom-performed “Fitzroy poems” from 24 Hours, a 740-page poetic record of the neighbourhood in the nineties. In a steady half-shout, П.O. described a walk around the pre-gentrification working class suburb with its cafés, grocery stores and “derros,” relating snatches of dialogue between shopkeepers and passers-by. My favourite moment: On board a tram an old man repeatedly wishes the conductor luck with his 6% pay claim, despite the conductor’s repeated assertion that he isn’t in the Union. П.O.’s frank delivery and autobiographical psychogeography of Fitzroy couldn’t have contrasted more with Charles’ musical setting of Jessica Wilkinson’s “marionette.” Spanning 100 pages of layered, fragmented and eroded writing and pictures, “marionette” is an obscured biography of the already-obscured life of Hollywood starlet Marion Davies. Through the twisting, fading and cutting of text and images, the book amplifies the themes of decay and silencing inherent in historical materials, as well as the very deliberate manipulation of Davies’ image by the media tycoon William Randolph Hearst. Charles’ setting for sampler, tape and saxophone (Charles) percussion (Matthew Horsely) and two voices (Jessica Wilkinson and Jenny Barnes) adds a new layer to the palimpsest of Davies’ story, drawing inspiration from both the content of Wilkinson’s book and its typographic manipulation. 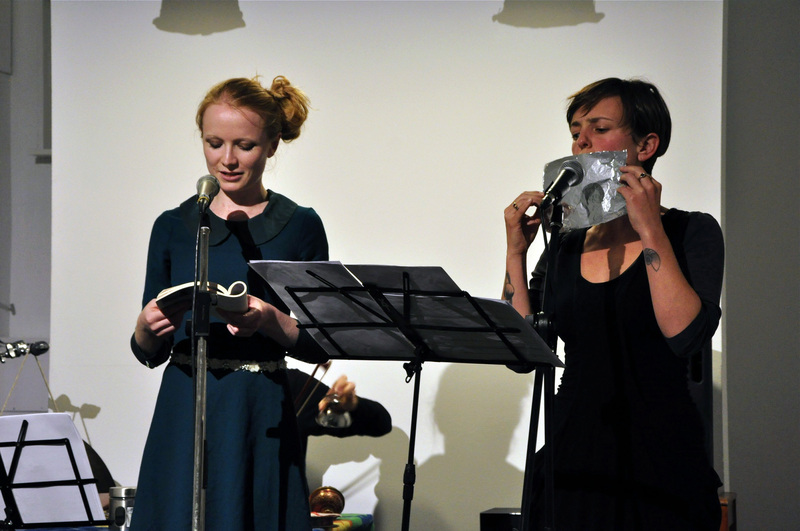 Jessica Wilkinson and Jenny Barnes perform marionette. Photo by Mandy Kitchener. As yet another form of silencing, Davies suffered from a stutter her whole life. Wilkinson’s textualisation of this stutter in her fragmented and halting text is tranformed into the short, scattered vocal sounds of Charles’ composition. Most of the time this percussive polyphony rises above a shifting bed of more sustained tones produced by the scraped glass and bells of Horsley’s battery, and Charles’ sampler. Like the three-dimensional effect of Wilkinson’s overlapping and untangling text, this distant, transparent texture is then brilliantly juxtaposed with a closer, denser texture where Horsely’s percussive interjections, the text of Charles’ tape and the speakers all brilliantly collide at the same dynamic. With the instruments dying away or stopping still, the last word of each episode is given to Wilkinson, who delivers punctual cadences like “now you’ve certainly spilled the apple cart” or “you know, the silly stuff.” The text closes the musical movement of each poem while opening up a field of interpretive ambiguity, highlighting the creative friction between textual and musical “openness”. A musical work can be formally closed (it has reached a point of resolution or symmetry, or its development appears exhausted), while its text may remain open, inviting expansion and development. The openness introduced by each of Wilkinson’s closing lines threads the nine poems of “marionette” together into a meandering, stammering, whispering song cycle. After the juxtaposition of П.O.’s autobiography and the biography of “marionette” I am again inclined to question the role of the artist-provocateur, as I have in relation to Matthew Herbert‘s End of Silence. The problem is that if there is no new historical material, judgement or conclusion in “marionette,” then it just repeats the silencing that it addresses. The tension of “marionette” lies in the audience’s paparazzi-like hunt for glimpses of Davies amongst the flow of corrupted text. As in the gossip columns of the day, only the promise of the “authentic,” unsilenced Davies lures one through the dross, even if it is now a purposely open, fragmented image. Does Wilkinson and Charles’ added noise in the message tell us anything new about Davies or the nature of history? If a certain degree of silencing is inherent in history, then what value can we attribute to the further, creative silencing of historical texts? There is in fact a critique in “marionette.” It is introduced through theoretical terms like “postmodernity” and “sexual politics” scattered through the text. However, left undeveloped as they are (the case would be different if we had the opportunity to read Wilkinson’s exegesis as well, or even had a pre-concert talk), the critical power of these terms is silenced through their aestheticisation.